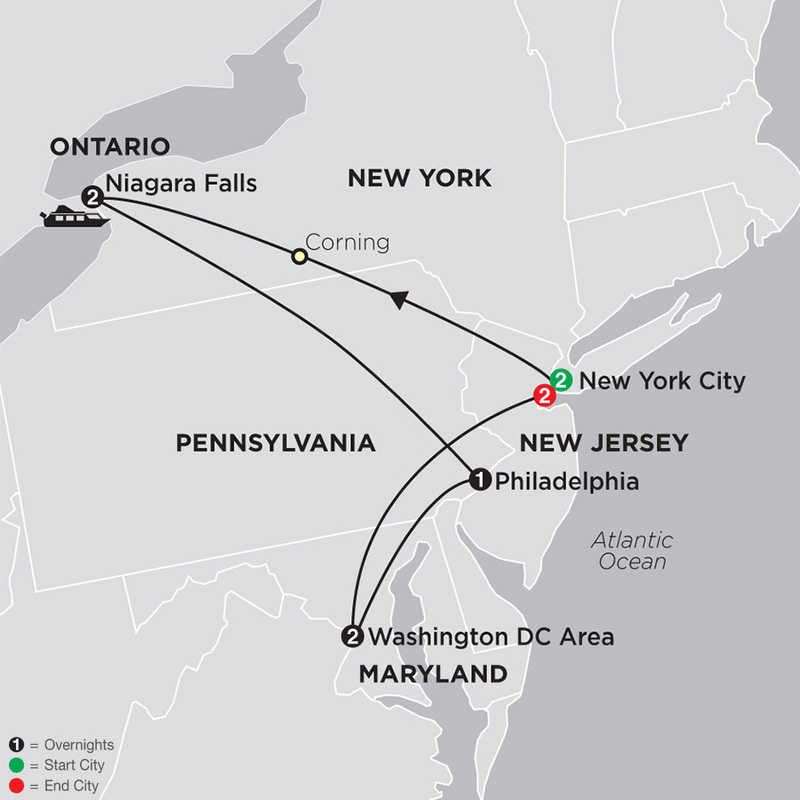 Historic sites, thrilling cities, and awe-inspiring scenery…these are the perfect words to describe this East Coast tour featuring New York City, Niagara Falls, Philadelphia, and Washington DC. You'll spend four nights in New York City, two nights in Niagara Falls and the Washington DC area, and one night in Philadelphia. You'll also visit Corning, New York, once voted Most Fun Small Town in America. On this affordable vacation, sightseeing or an orientation tour is included in each city. In New York City, see the major attractions, including Broadway, Wall Street, the Empire State Building, and more. Two extra nights in New York City at the end of your tour give you the opportunity to discover the city's sights and to join optional activities, such as a Manhattan harbor cruise. In Philadelphia, see the historic landmarks. In Washington DC, visit Arlington National Cemetery, where John and Robert Kennedy are laid to rest; the Lincoln and National WWII Memorials; and the Washington Monument. Also enjoy photo stops at Capitol Hill and the White House. This East Coast tour also features gorgeous scenery. Enjoy drives through the picturesque Poconos and through the beautiful Appalachian Mountains into the Susquehanna River Valley. But that's not all…wait until you witness breathtaking Niagara Falls! Be sure to have your camera ready as you enjoy a sightseeing cruise past the world-famous falls. During your free time in Niagara Falls, perhaps visit the Butterfly Conservatory, Great Gorge Adventure, or Botanical Gardens, or ride the aerial cable car. From the bustling cities to the majestic scenery, this East Coast tour is a great vacation for savvy travelers. You're sure to arrive home with plenty of stories and photos to share.